One of the first things we are asked when a new athlete starts Crossfit is "how can I get quick results?" The best recipe we have found is CrossFit Training coupled with proper nutrition. A proper diet must provide a few things: the nourishment your body needs, a wide variety of foods, and ultimately the diet must be sustainable. As CrossFit athletes that are physically demanding of our bodies, we need to take the time to refuel with the proper foods. When it comes to food, it can be a make or break of a workout, accomplishing set goals, or how you feel physically and mentally. At CrossFit Mechanix, you will be provided with a recommended foods list to help you identify which foods will benefit you, along with which foods might be holding you back. Whether you are looking to lose those last few pounds, or set a new PR, nutrition is the foundation. There are literally thousands of diets promise fast and lasting results, however, through our experience, we have found that following the recommendations below will provide the nourishment and health-promoting ingredients necessary to live a long and healthful life. To put it simply, the Paleo Diet consists of foods available to humans in a time of the hunter-gatherer. While we may not know the entire diet of our Ancestors, they did leave us clues that give us insight into much of what they did and didn't eat. 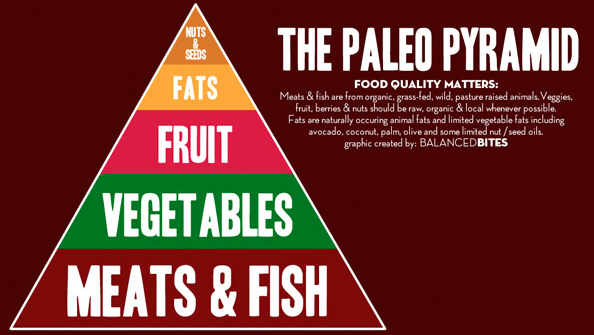 The Paleo Diet only consists of whole food groups such as, plants, animals, insects, and fungi. These foods were acquired through hunting and gathering, which were typically laborious and often dangerous tasks. Even with an unlimited choice of foods presently, many of the "foods" and supplements available do not give our bodies the sustenance it requires to perform optimally and prevent many of the diet-related diseases that the Paleo Diet addresses. Listed below are just a handful of healthful foods along with foods that are discouraged due to their useless or detrimental effect on the human body. 2.5 million years ago during the Paleolithic era, the food found in nature was the only sustenance available. During this time, the human body thrived and evolved to be stronger and more resilient with this diet. Not until the invention of agriculture and food industrialization did we see the slow decline of health and increase of inflammation related diseases. Fruits - Berries, apples, pears, peaches, apricots, figs, cherries, strawberries, etc. *These whole food sources are encouraged due to their high nutrient bio-availibilty and anti-inflammatory properties. Grains - Wheat, corn, barley, oats, etc. Processed Seed/Vegetable Oils - Soy, corn, canola, sunflower, etc. These foods are discouraged mainly for their high-inflammatory properties and anti-nutrient content. Foods in this category promote chronic systemic inflammation that leads to many of the common ailments and diseases (high blood pressure, high cholesterol, cancer, diabetes, acne, low energy, etc.) that plague many Americans. The Paleo Diet has been shown to decrease symptoms and sometimes can even reverse damage created by poor lifestyle and diet choices. Note: while some of the diseases above can be attributed to inherited genes in certain individuals, a proper diet can help prevent an environment in which diseases thrive. Feel free to ask your Coach for any nutritional guidance or recommendations. We are just as passionate about total health optimization as we are about CrossFit Training.